Pregnancy Week 24: Avoid stress and get plenty of rest! When baby is born, everything is cute and round and they have a reserve layer of fat over their entire body. By this week, baby has not got that yet. Neither does baby have the full layer of subcutaneous tissue, so baby is still very thin and fine. Baby’s entire body, apart from the lungs, is now well developed. So, you’ve guessed it: your baby will now start developing their lungs! The senses are also developing by the day. 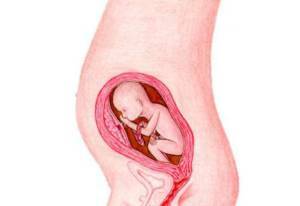 Baby hears sounds and learns to recognize then and baby is sampling the amniotic fluid. Your baby now weighs (an average) 1.32 pounds and is 11.81 inches. Your baby is getting better at hearing. Lay in a bath with your head under the water and listen to the sounds. This is comparable to what your baby is hearing! You don’t have real contractions yet, it is still too early. But your belly may sometimes feel hard and then relax again after a while. These are Braxton Hicks, which are practice contractions or pre-labor contractions. Your stomach tenses up and then relaxes. You are more likely to get Braxton Hicks when your baby is growing very quickly. You may also notice your belly gets harder more often if you are under stress or very busy. Your hard belly cannot harm your baby, but stress can. Your baby is then exposed to excessive levels of cortisone, the stress hormone. Some women cannot avoid stress, but do pay attention to it. If you can avoid any kind of stress, then avoid it! So, don’t get all worked up when you still have another pile of washing to get through. The baby growing inside of you is much more important than that!